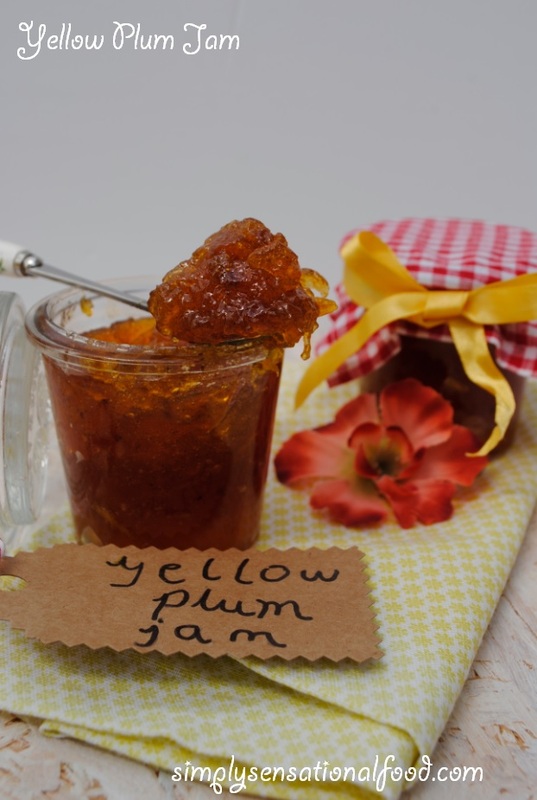 Tangy and sweet plum jam. 1. 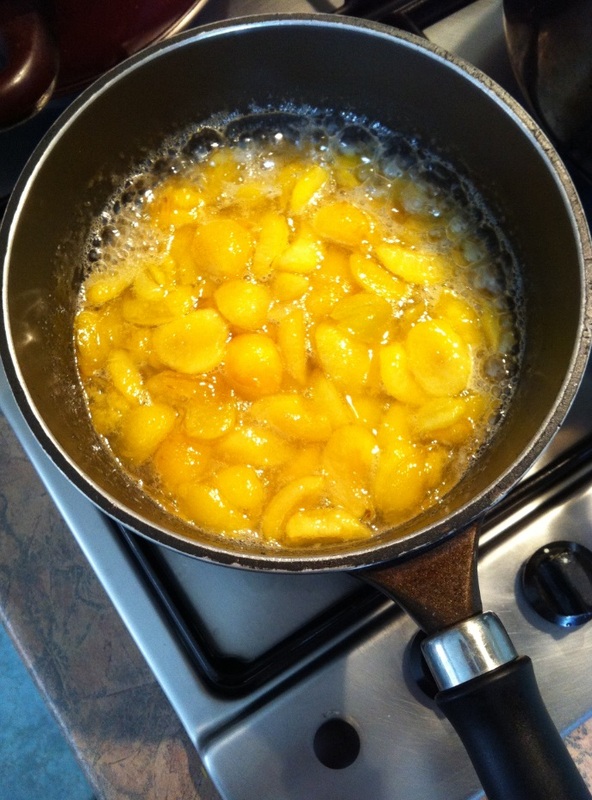 Add the stoned diced yellow plums to a heavy based saucepan with the sugar and lemon juice and heat on a medium heat until sugar starts to melt.2. Shake the pan and continue to cook the jam on a slow boil until plums start to break down and jam thickens, it takes approximately 15-18 minutes.3. To check the setting point of the jam place a sugar thermometer in the jam and move it around so that you get an even heat distribution, than take pan off the heat and take reading. The jam should be at 105 degrees C or 215 degrees F.4. 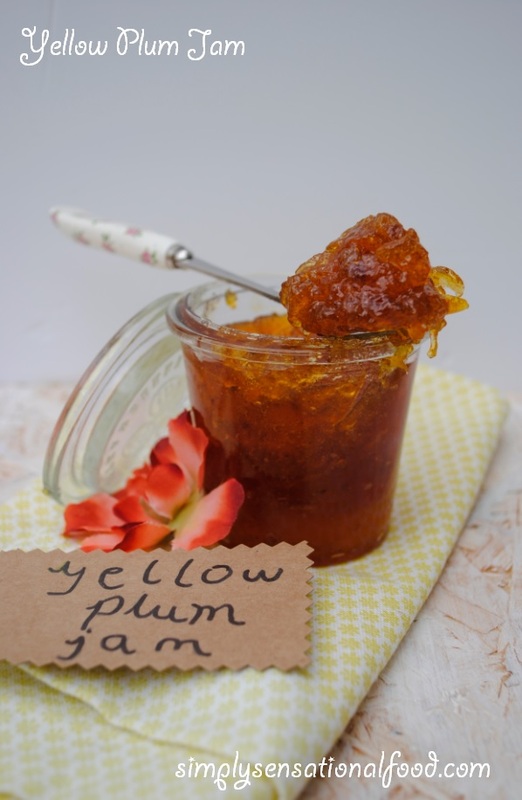 Once jam reaches the required temperature, remove the pan from heat and allow to cool slightly.Transfer the jam to sterilised jam for storing. As a child I lived in East Africa, I have fond memories of a large house with a verandah surrounded with orange, lemon, lime, mango and papaya trees. We had a backyard which went on for miles and miles and every vegetable imaginable was grown in it. We had mint,coriander, fenugreek, chilli plants, sweet corn, plantain trees. We also had tomato plants, all types of green beans, fresh garlic, spring onions, potatoes, aubergines and many more vegetables that I can't even remember names of. All our fruit and vegetables was sourced from our vegetable gardens and it was only when certain vegetables were out of season, that my mum would make a trip to the local market to buy her vegetables. 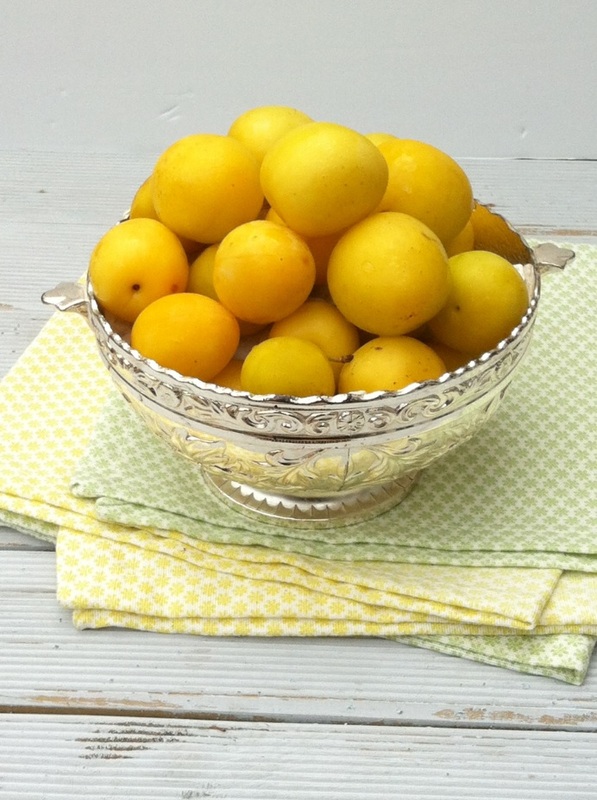 There were no chemicals or pesticides used and everything was organic and tasted beautiful. No vegetable was uniform shaped but you knew that it would taste great never the less. 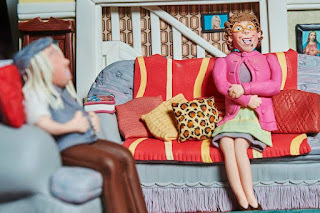 When my parents emigrated to the UK, my mum found it really hard to adjust. She hated having to shop at the super market for her fruits and vegetables and she found it really difficult to find asian vegetables unless we travelled miles to source an asian supermarket. Feeling frustrated my mum started growing her own vegetables and herbs in the English backyard which was barely 20 ft. This was difficult with the soil and the climate but my mum never gave up. She would work hard digging and planting and cultivating seeds. Often she faced failure after failure because of the bitter frost and English weather but she never gave up. I still remember the look of joy on her face when she got her first crop of green chillies. Years went by and my mother's vegetable patch flourished, but sadly she passed away, my father maintained the vegetable patch and we carried on enjoying the vegetables from my mother's vegetable patch for many years, that is until my father passed away too and the house was sold. I have always missed not having the luxury to have home grown vegetables, with work and children I have never had the time to start up my own patch although I would love to one day. I really admire people who spend the time and effort to grow their own produce. One such friend is Heidi , she is a food blogger friend who has magic green fingers. 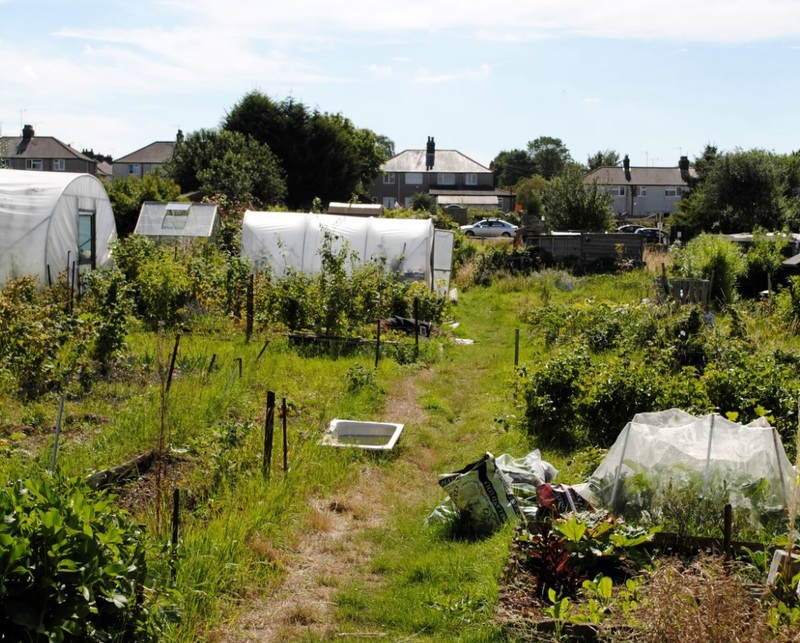 She has her own allotment where she grows a variety of herbs and vegetables. 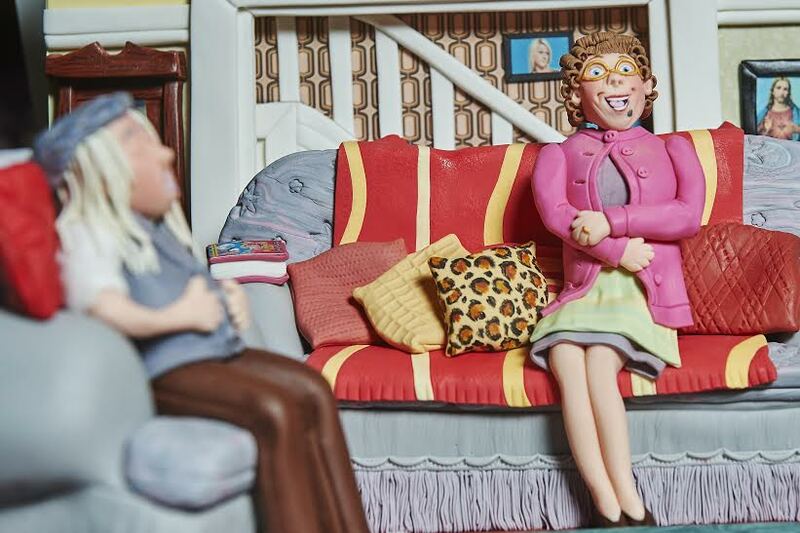 Chatting to Heidi about her allotment brought back childhood memories. It made me quite emotional and when Heidi invited me along to her allotment to pick some fresh produce I was over the moon. I think Heidi didn't realise how special it was for me to visit the allotment and relive the memories of my mums vegetable patch. Heidi grows a variety of herbs and vegetables 0n her allotment, she maintains the allotment with her partner Clive and together they have created a vegetable paradise. 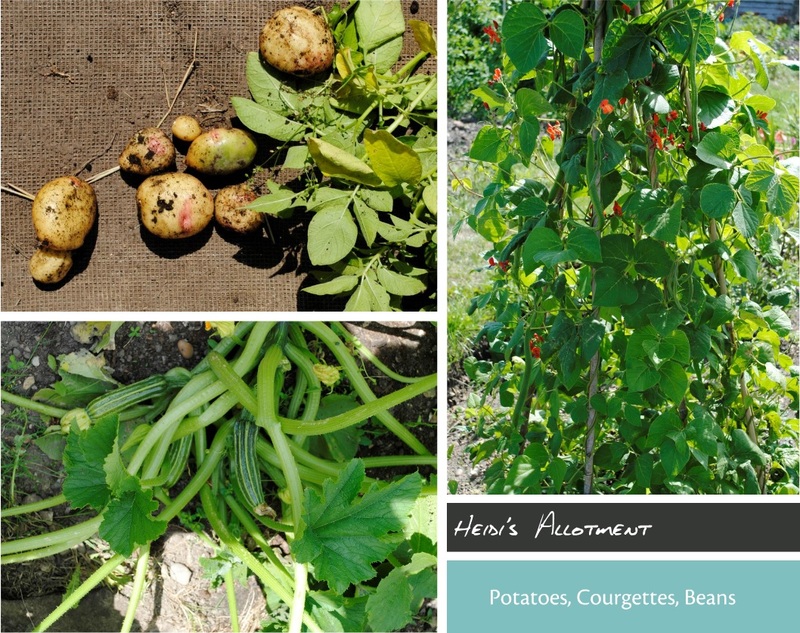 On the allotment she has potatoes, courgettes and beans which were ready to be picked. 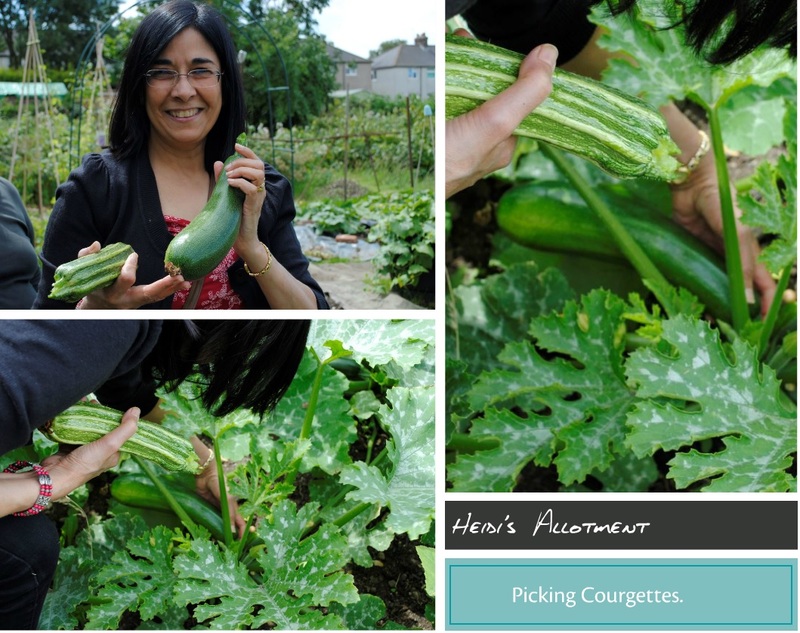 I really had fun picking the courgettes, she has two varieties a courgette with ridges and a smooth variety. 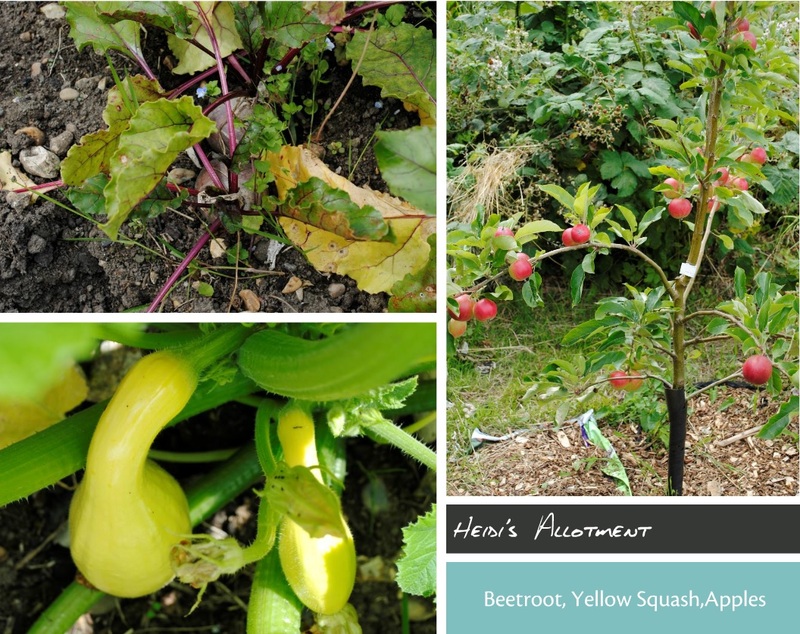 Below you can fresh beetroot, yellow squash, cucumbers and you can also see the mini apple tree, the apples were not quite ready to be picked. The purple beans were really interesting, although they were not long enough to picked and needed a few more days before harvest. 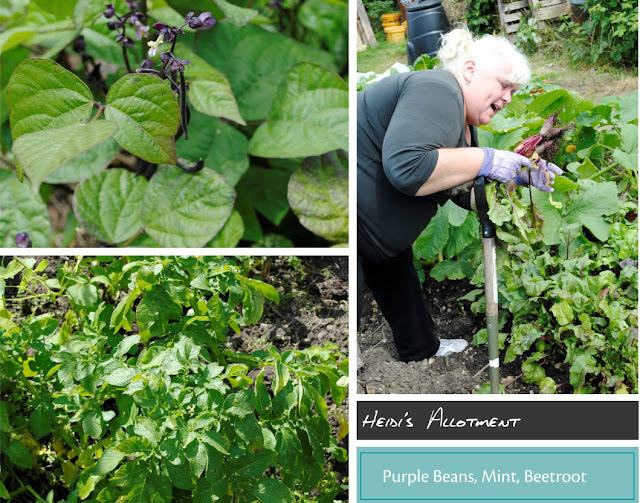 On the allotment Heidi also grows fresh mint, lavender and oregano. 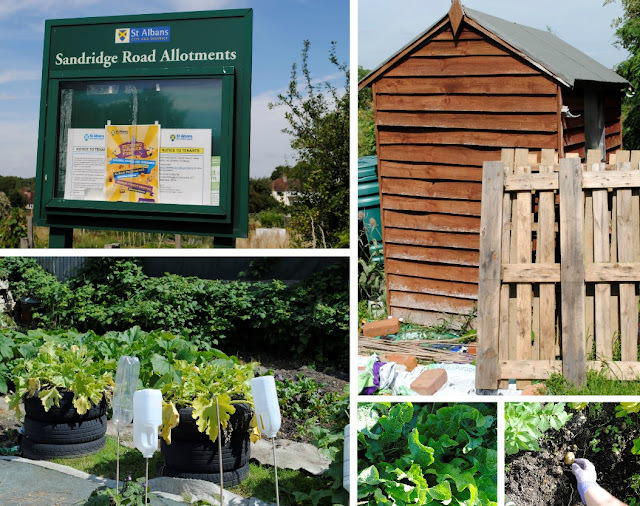 Spending the afternoon at the allotment was really fun and Heidi and Clive also showed me around the other plots too. There was a lovely community feel and camaraderie amongst the plot neighbours . I was able to see a variety of other produce such as gooseberries, redcurrants, corn, spring onions, pumpkins and many other fruits and vegetables growing. After a glorious afternoon at the allotment, we had the most delicious lunch at Heidi's made with the fresh produce. I can't wait to go again to visit Heidi as her allotment has definitely stirred my childhood memories for me. I had a lovely visit and armed with bags of fresh home produce I arrived home. 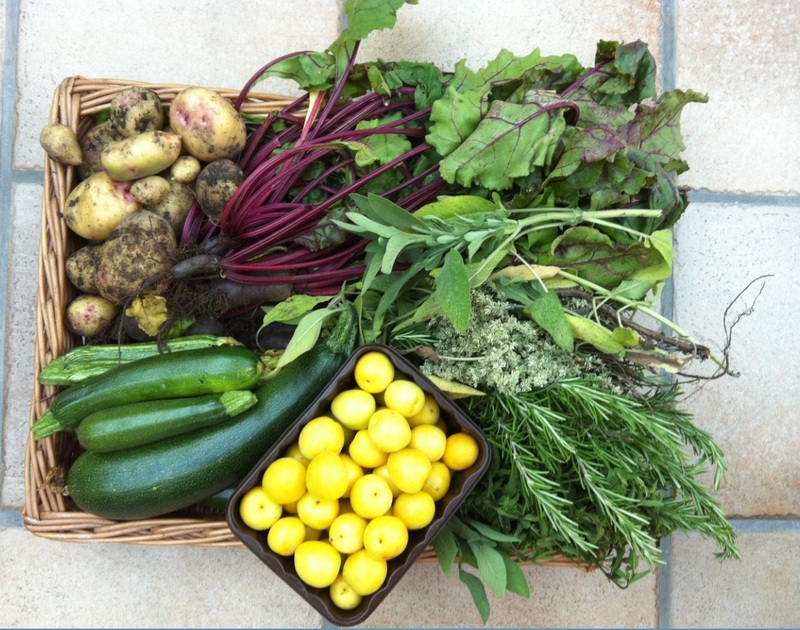 My next task is to create some recipes with my freshly picked courgettes, yellow squash, beetroot, oregano, mint, potatoes and rainbow swiss chard.